The calm of Saturday took a turn Saturday night as winds picked up - the remnants of Hurricane Earl. By the time I took Arayo out for a 6m potty break, the wind was so fierce that road signs were really swinging and singing. The question now is if the Provincial parks are open for business so I can proceed my camping journey! We attended two dog shows Saturday. A big beautiful Newfoundland Dog, Ch Homeport Isaac Island, bred by Devon Nutbeem and owned by Douglas and Kaireen Chaytor of Halifax won Best of Show, so the after party at Megan Nutbeem's was truly a joyful affair for we Newfoundland owners! Photo: On May 20, 1932, Amelia Earhart became the first woman to fly solo across the Atlantic. Her trip originated from the airport of the small Newfoundland town of Harbour Grace. We titled this photo "DOG is my co-pilot". Maybe she needed a good Newfy copilot on her later journeys. The landscape image was taken on the Irish Loop. I didn't notice it when there, but in the photos, I swear that is a giant grass covered woman's torso out in the water! Glad to hear you made it through Earl ok! Arayo adds a touch of class to any location. Would love to know when you are going to be heading through central Newfoundland ie: the Gander/Grand Falls area. 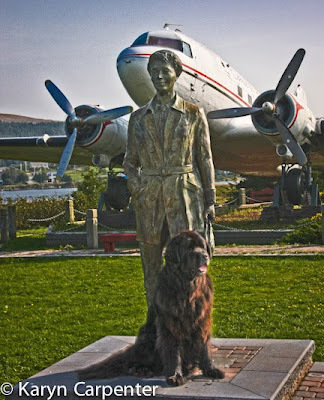 I would love to come and meet you and Arayo with some of my Newfs.. unless you are interested in coming to the Twillingate area.. then I would be happy to be your tour guide.. the best I can! Have a great journey no matter what!!! I leave Carbonear today and will spend at least one, maybe two, days near Bonavista. Then, to Gander. Probably be there on Wednesday. If you have a spot in the yard for a tent I can come up. and crash near you. I'd love to see your piece of the world! 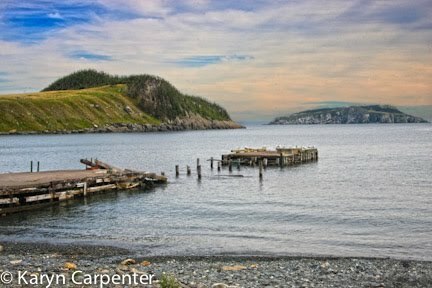 Karyn, next time I visit Nf I'll take a new photo of the Island where the sheep graze, ramshead on the Island.. This time I'll take a shot of the boardwalk from the ground out.. If I recall though it wasn't very clean.